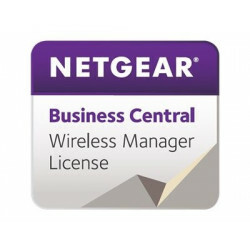 Netgear's Business Central 2.0 Wireless Manager is a cloud based IT service platform that offers SMB's and enterprises an affordable way to establish, provision and manage their IT networking services. Business Central offers users an intuitive web interface that allows them to control and or monitor their wireless access points and clients directly from the cloud. Based on Software-as-a-Service (SaaS) infrastructure, this solution is the optimal tool as it does not require on premise hardware installation. Business Central manages a complete line of ProSAFE access points by means of a single sign-on integration with the MyNetgear support portal. Why buy Business Central 2.0? Business Central Wireless Manager is a Cloud based management service that offers end users or service providers an easier way to establish, provision and manage their WiFi network. This license key gives users the ability to manage (1) Access Point for 12 months. Business Central Wireless Manager is a Cloud based management service that offers end users or service providers an easier way to establish, provision and manage their WiFi network. This license key gives users the ability to manage (1) Access Point for 36 months. Business Central Wireless Manager is a Cloud based management service that offers end users or service providers an easier way to establish, provision and manage their WiFi network. This license key gives users the ability to manage (10) Access Point for 12 months.